An Offer that Celebrates the end of the Mayan Calendar and Starts Something New! A- Bias shell dress – Fitted shoulder line ( seen Inside out here.. I am a fashion designer using technology… Unlike most In Fashion Tech Marketing is NOT the only thing that technology can do for my niche! I teach… design and fit! In person workshops -. Learn 3 different construction methods- Hand French seem and stitch and serge!Communicate design ideas without sketching! Private Web & Video Group Sessions! Showcase & Sell – Lets make his fun! Chose to take orders and sell … we’ll even help you! Adults only… petites to plus! Fabrics additional Morning evening and weekend sessions! Details will be sent to those that sign Up! Image Credits:- I’m adding a new product or rather a series of workshops that make up a complete “course” ! At the end of the first series you will be able to make all the images picture in this picture here.. . and much more including accessories and pants! 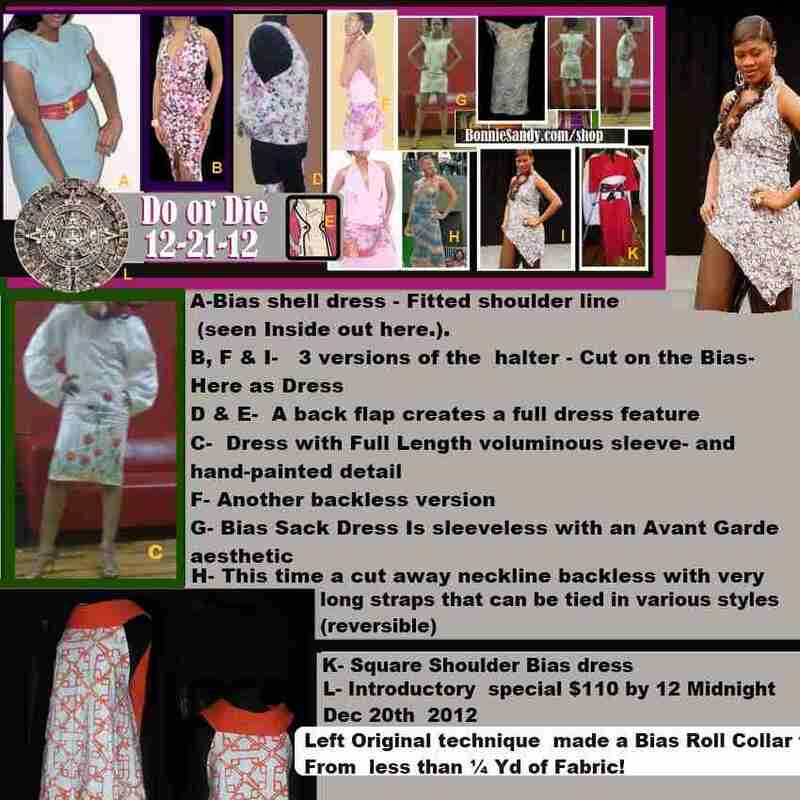 But you’ll also understand The process of taking a garment to market! You can Buy One of these … or you can learn to make them and earn! Why… I want to help you design , I love sewing and it’s time to share! The sessions are targeted to cost a total of $440.00 but you get these for $110.00, Half the Holiday special of $220, (Plus the cost of supplies)! Make in your size or a Friends! [daughter, mom] All sizes.. You’ll Be given access to the Group on Dec 24th! Scheduled dates will be announced then (Morning, Even, Weekend ) session, and can be used on set days during January to April! Out Of Towners welcome! Posted in Latest and tagged Boutique Solutions, Design Techniques, Social Styles, Workshops.